How many times have you thrown out bananas that were black or getting black and overripe? Don't do it anymore!! Throw them in a Ziploc and toss them in the freezer! Use them later for banana breads, muffins, cakes, anything! Anything you have to throw away becomes expensive!! I refuse to throw things away! Ok well if they are hairy and crawling toward the trash themselves, I will help them along! These muffins are delicious. They are not your light airy muffin. They are dense, almost like bread. Some of the ingredients might surprise you. Might make you go "Hmm...". They all work brilliantly. 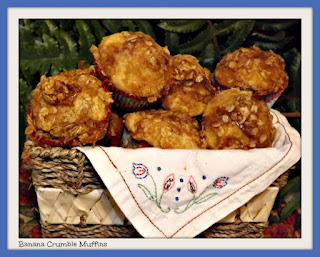 These are muffins you KNOW you are eating, and with a cup of coffee or tea, or juice, what a great breakfast or anytime-snack! Combine all ingredients except flour in a stand mixer or by hand. When completely combined, add the flour in 2 or 3 additions, mix only until all flour is incorporated then stop!! Using paper liners, fill muffin tins. You should get 24 muffins. Now set aside and mix up your crumble! You can spray your pan or butter it liberally if you don't want to use liners! Combine completely and then using a spoon sprinkle over all of the muffins. Try and press it down so it stays mostly in the middle!! Bake for 12-15 minutes. Let cool in pans and remove! will have to try these for sure! !